Harald Grove M.Sc. Student. Metabolic physiology of Galleria mellonella. (co-supervised with Dr. Cassone). Nicholas Kurchaba M.Sc. Student. Establishing zebrafish PGC-1 CRISPR mutant lines as a biomedical model. Courtney Geer B.Sc Biology (Topics/Summer student). Long term physiological effects of microplastics ingestion in zebrafish. Harald Grove Undergraduate Thesis student. Digestive physiology of Galleria mellonella. (co-supervised with Dr. Cassone).Current position: M.Sc. candidate. Nicholas Kurchaba Undergraduate Thesis student. Project: Inflammatory response of microplastics exposure in zebrafish larvae. (co-supervised with Dr. Ardelli). Current position: M.Sc. candidate. Caleb Northam USRA student/Undergraduate Thesis student. Project: Metabolic effects of PGC-1s silencing in larval zebrafish. Current position: 4th year Honour student. Bailey Kelleher Topics/Summer student. 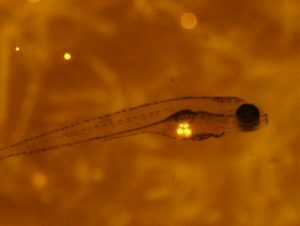 Project: Transcriptional effects of microplastics in larval zebrafish. Charlotte Smith Topics student. 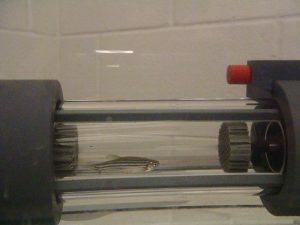 Project: metabolite profiling in migrating gobies. Current position: Bachelor of Nursing candidate, Brandon University.